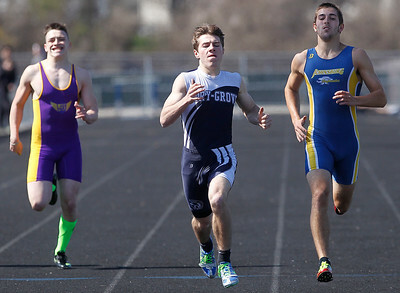 Matthew Apgar - mapgar@shawmedia.com Wauconda's Antonio Acosta, left, Cary-Grove's Ryan Magel, center, and Johnsburg's Bailey Stefka, right, head for the finish line in the 200 meter dash semifinals event during their track meet on Saturday, April 11, 2015 at Cary-Grove High School in Cary. 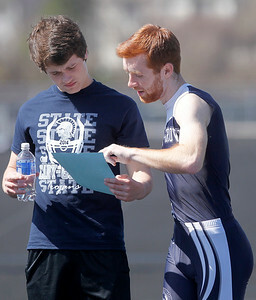 Matthew Apgar - mapgar@shawmedia.com Cary-Grove's Michael Saxon checks his time after finishing first in the 110 meter high hurdles semifinals event during their track meet on Saturday, April 11, 2015 at Cary-Grove High School in Cary. 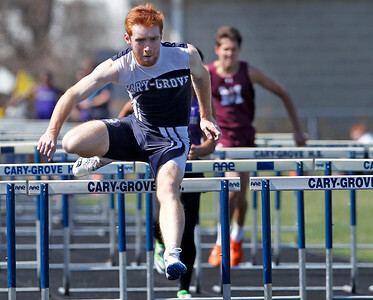 Matthew Apgar - mapgar@shawmedia.com Cary-Grove's Michael Saxon clears the final hurdle in the 110 meter high hurdles semifinals event during their track meet on Saturday, April 11, 2015 at Cary-Grove High School in Cary. 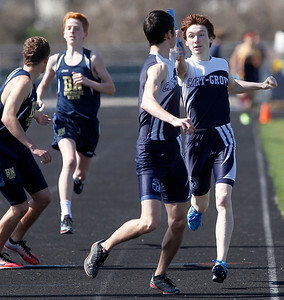 Matthew Apgar - mapgar@shawmedia.com Cary-Grove's Jack Adams, right, hands off the baton to teammate Joe Veal in the 3200 meter relay event during their track meet on Saturday, April 11, 2015 at Cary-Grove High School in Cary.